Horses can wind up suffering from less-than-ideal hoof conformation due to genetics, poor physical conditions where they are stabled or pastured, a lack of hoof care, and improper hoof care. Often, multiple factors at once play roles in creating hoof problems. If your horse has a hoof problem, you will need to work hand-in-hand with your farrier to correct it if you want to avoid long-term lameness. 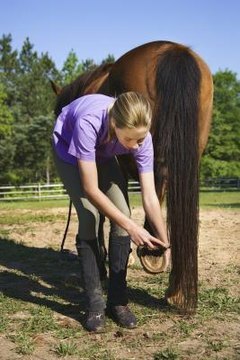 The underside of your horse's hoof is his sole, and you will not see the sole unless the horse's hoof is off the ground. The sole of a normal hoof is concave in shape, with the heart-shaped frog in the center of the sole and the edges of the sole meeting the thick hoof wall. A horse with a normal hoof walks primarily on the tough hoof wall, which grows continuously and is made of hard tissue that is similar to a human's fingernails. The frog of a healthy hoof will also come into contact with the ground as the horse walks, providing extra traction and shock absorption. When horses are described as having flat feet, what is really being said is that the sole of the hoof is more flat than concave. A flat-footed horse is walking on the sole of his foot as well as on the hoof wall and frog. Flat-footed horses are often sore-footed or lame, since the sole of the hoof offers little protection against rocks and other rough, potentially painful objects. It should be noted that no scientific evidence exists to suggest horses are born flat-footed or that the bone structure within the hoof is responsible for the development of flat feet. In most cases, flat feet are the result of poor or incorrect farrier care. Horses with genetically misshapen, weak or flawed feet may be more likely to become flat-footed over time. Horse shoes are the fastest means of making a horse who is walking on the sole of his hoof more comfortable. Horse shoes are nailed into the hoof wall and will add height to the underside of the hoof wall, effectively lifting the sole off the ground. Your farrier will be able to determine the most effective type of horse shoe to meet your horse's unique needs. Corrective hoof trimming and maintenance can help lift the sole and return some of the concavity to the underside of the hoof. In most cases, your farrier will need to shorten the toe of the hoof and add height to the heel. It will take an extended period of time to correct the shape of your horse's hoof enough to eliminate the appearance of having a flat foot.